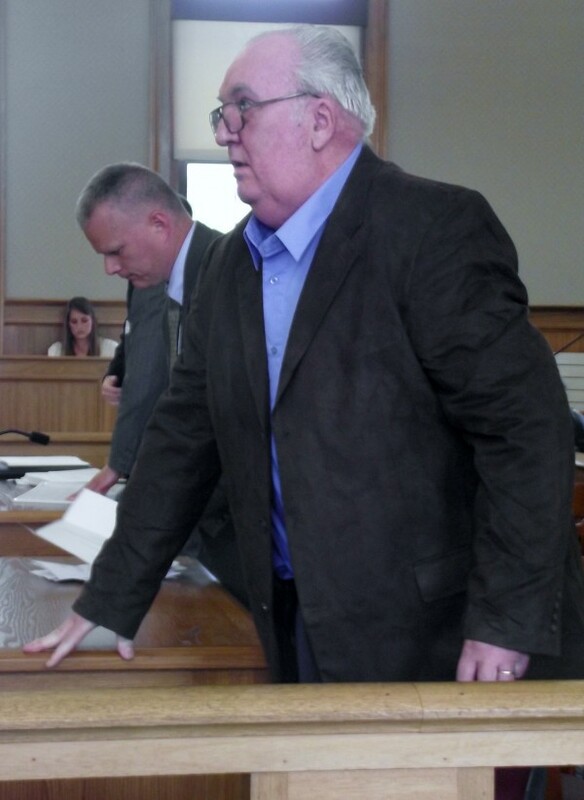 Robert Strout of Orient heads toward Aroostook County Sheriff's Department deputies on Wednesday, May 23, 2012, to be handcuffed and taken to prison for four years after his sentencing in connection with the 2010 triple homicide in Amity. Strout was sentenced in Superior Court in Houlton for hindering apprehension, arson, aggravated furnishing of scheduled drugs, and violation of bail. Next to him is his attorney, Stephen Smith, who pushed Justice E. Allen Hunter to sentence him to just two years in prison. 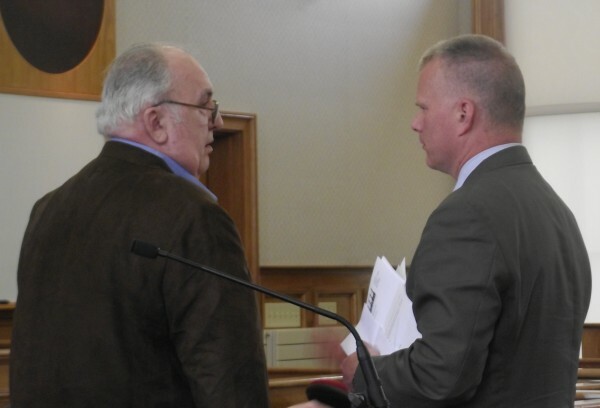 Robert Strout (left) of Orient stands with his attorney, Stephen Smith of Bangor, just before he heads off to prison on Wednesday, May 23, 2012. Strout was sentenced in Superior Court in Houlton in connection with the 2010 triple homicide in Amity. He will serve four years in prison for hindering apprehension, arson, aggravated furnishing of scheduled drugs and violation of bail. HOULTON, Maine — With his wife and members of the victims’ families looking on, an Orient man was sentenced Wednesday to serve a total of four years in prison in connection with the 2010 murder of three people in Amity. 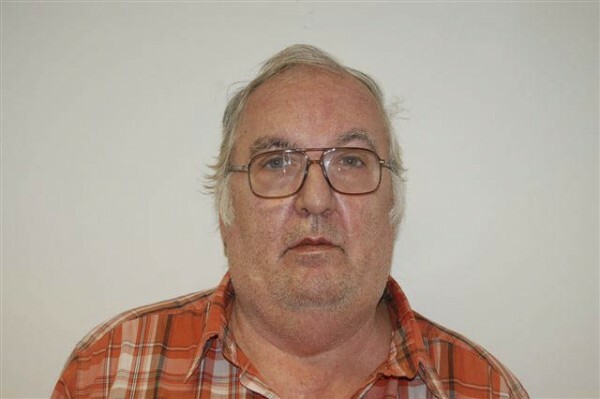 Robert Strout, 64, appeared in Aroostook County Superior Court before Justice E. Allen Hunter in connection with the slayings and an August 2011 drug offense. Strout, who was in court with his wife, Joy, was sentenced to 10 years in prison with all but four years suspended, along with three years probation, for a hindering apprehension charge. He cannot consume or possess drugs or alcohol and must take all medications as prescribed. He cannot have contact with the victims’ families and will have to pay a $10-per-month supervision fee. He was given a four-year concurrent sentence on a charge of arson, along with a two-year concurrent sentence for aggravated furnishing of scheduled drugs and a $400 fine. Strout was given a six-month concurrent sentence on the bail violation. The overall sentence was the maximum that Strout could have served under a plea deal offered to him by the state. Assistant Attorney General Andrew Benson said Wednesday that the plea was offered to Strout in exchange for his testimony against Thayne Ormsby, 22. Ormsby, an Ellsworth native, was convicted on April 13 of three counts of murder for stabbing to death Jeffrey Ryan, 55, Ryan’s son Jesse, 10, and Ryan family friend Jason Dehahn, 30, all of Amity, on June 22, 2010. The victims were found dead about 27 hours after the killings at the elder Ryan’s home on U.S. Route 1, according to police. Ormsby also was found guilty of arson for burning Jeffrey Ryan’s truck after he stole it from the murder scene. The state did not end up needing Strout to testify. Under the deal, he could have spent up to four years in prison but not less than two years. Strout was charged in September 2010 with hindering apprehension and arson for his role in helping Ormsby conceal evidence in the murder investigation. In the weeks before the killings, Ormsby lived a short distance from the crime scene at the home of Strout and his wife. Strout told police in July 2010 that a bloodied Ormsby came to his home after the slayings and threatened to kill his family if he did not take him to Weston to burn his bloody clothes and to set Ryan’s truck ablaze. Strout also drove Ormsby to a bog where he disposed of the murder weapon. Two days later, Strout drove Ormsby to Strout’s son’s home in New Hampshire, where Ormsby eventually was arrested. bail when he was arrested by officers with the Maine Drug Enforcement Agency in August 2011 and charged with aggravated furnishing of scheduled drugs and violation of bail. In court, Benson said that after the murders, Strout lied to Maine State Police detectives three times, covered up for Ormsby, helped him conceal evidence in the homicides and drove him out of state to stay with his son in New Hampshire. He only admitted his culpability when he was “boxed in,” Benson told Hunter. Roughly 15 members of the Dehahn and Ryan families were in court. Benson said that Jason Dehahn’s father, Robert Dehahn of Amity, did not think that four years imprisonment was enough but accepted the sentence. He did not address the court. Melanie Dutra, one of Jeffrey Ryan’s daughters and Jesse Ryan’s sister, said that Strout deserved the maximum allowable sentence. She said that after her father’s home was cleared as a crime scene, Strout showed up and asked for some of his property. He also was on the news talking about what a great father Jeffrey Ryan was, all the while knowing that Ormsby was the killer. “He harmed his community, our family and his own family,” she said. Clad in a chocolate brown coat, gray pants, a blue shirt and no socks with loafers, Strout’s head trembled noticeably during the hearing. Smith said that Strout suffers from diabetes and other ailments, has had quadruple bypass heart surgery and was on a number of medications. “He believes he’ll die in jail,” the attorney told Hunter. During the hearing, Strout turned toward the Strout and Dehahn families and apologized, saying he had made “poor decisions,” but he did not kill anyone. Hunter said he understood that Strout was getting older and was in ill health, and understood how Strout could have felt “confused and uncertain” after the murders. “But you had ample opportunity to tell the truth and you didn’t,” the judge said. Hunter said that he would use Strout “as an example to give fair warning to those who would obstruct justice” and imposed the maximum allowable sentence under the plea deal. Strout, who had been free on bail since he pleaded guilty to all the charges in October 2011, was immediately taken into custody to begin serving his sentence.